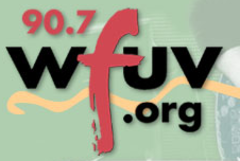 WFUV in New York City is Fordham University's public radio service, known for its thoughtful approach to popular music. The station's award-winning signature mix of adult rock, singer-songwriters, blues, world music and more is heard on the radio in the New York area at 90.7 FM and beyond on the web at wfuv.org. Our staff is looking forward to sharing music and information specials with fellow PRX member stations, so please watch this space for details. End of the fiscal year fundraising spots, featuring tart-tongued Assistant General Manager Ginger Calder. A series of short essays, mixed with natural sound, from organic farmer Cindy Jones. Short drop-ins featuring workers who make a living in unusual ways. Josh Ritter performs at Electric Lady Studios in New York City. Remembering days at a gritty but still summery Bronx beach. The Blind Boys of Alabama perform a live concert at the Cutting Room in Manhattan. A panel discussion on progress in Lower Manhattan six years after the 9/11 attacks. A visit to a local New Orleans bar reveals stories of Katrina's lingering effects.